Brickwall is the term used in family history research to describe the situation that arises when you are completely stuck in trying to trace your ancestors further back. Sometimes the solution is not to try to batter your way through but to work your way around it. There are some family names that are so common that they make research particularly difficult. My father’s family name Wilson was once said to be the most common name in the Glasgow phone book. When I worked on a human resources system, based largely in London, Williams and Patel were the most common names. So when I was contacted by someone with the surname Morgan my heart did sink a little. Of course Henry Morgan is one of the most famous names associated with early Jamaica, but there was no suggestion that this family were related to him. My starting point was James Hungerford Morgan who was listed in the Bristol Poll Book for St Nicholas in 1774 as a linen draper. On the 29 November 1782 he married Juliana Wisdom James, from a long established colonial family, in Trelawny, Jamaica. They had four children baptised there before James died in April 1792. Juliana remarried the following year on the Fontabelle estate to William Pitter and had four more children with him. The line of descent from the two sons of James and Juliana (Henry Rhodes Hungerford Morgan and James Hungerford Morgan II) had already been well traced by my enquirer who really wanted to know who were the parents of the first James Hungerford Morgan after whose marriage many descendants bore the double name Hungerford Morgan, sometimes hyphenated. This certainly suggested that Hungerford was an important family name and a connection to be cherished. The obvious starting point was to look for a marriage between a Morgan and a Hungerford and sure enough there was George Morgan married to Mary Hungerford in August 1685 in London’s St James Dukes Place, which had a reputation as a ‘marriage factory’ where you could go to get married in a hurry and relative anonymity. It may be that Mary was already pregnant or that her family disapproved of George, or both, since back in her home parish of Windrush in Gloucestershire the following year their daughter Margaret Mary was baptised in July and their son James in November. The Hungerfords were prominent in Windrush but when James was baptised the parish register only recorded him as James with no middle name. In any case it seemed likely that James Hungerford Morgan was born in the early 1750s so although geographically Windrush and Bristol are not far apart this left a period of about seventy-five years to bridge. Looking again at the Bristol records there was a Henry Morgan, also a linen draper, in the Poll books at the same time as James Hungerford Morgan. There is also a catalogue entry in the Bristol Record Office dated 1778 for a mortgage “James Hungerford Morgan, planter of Jamaica, now resided in Bristol, to Henry Morgan of Bristol, linen draper”. This also suggests a connection between the two, perhaps as brothers, uncle and nephew, or father and son. Unfortunately there is no online record for a baptism for James Hungerford Morgan, although plenty for James Morgan in and around Bristol in the relevant period. Of course with the surname Morgan he might have been an incomer from Wales, there being regular commerce and connections across the River Severn down the centuries. The solution came via a catalogue entry at the National Archives for a legal case involving ” Henry Morgan, linen draper of Bristol and Catherine Morgan his wife (late Catherine Oliver, spinster)”. When I found that Catherine had a brother named Hungerford Oliver I knew I was on the right track – her first son Edward was named after her ironmonger father Edward Oliver and James after, it must be presumed, her favourite brother. Hungerford Oliver later married Prudence Milward of Old Swinford, Worcestershire, apparently rather against her father’s inclinations and had something of a reputation as an eccentric. Sadly their son Thomas Milward Oliver who trained as a doctor was later to hang for murder. The confirmation of the parentage of James Hungerford Oliver comes from a series of family Wills, although finding his father’s Will proved challenging. Catherine Oliver’s mother Jane was clearly a wealthy woman with property in Bristol and on her death in about 1772 she left legacies to numerous family members including her grandchildren among whom were Thomas Hungerford Powell (son of her daughter Jane) and the four children of her late daughter Catherine and Henry Morgan, who was one of her executors. Tracking down Henry Morgan’s Will took a bit of guesswork. There was no Will for a Bristol linen merchant of that name so I wondered, since his grandson James Hungerford Morgan II had died at Tenby, whether Henry Morgan had retired to Wales. There were four plausible candidates and looking at the map of south Wales I opted to start with “Henry Morgan of St Brides in the County of Glamorgan Gentleman” and struck lucky. It was not uncommon to make the transition from trade to gentleman, and Henry’s Will finally confirmed for certain that he was the father of James Hungerford Morgan. How the name Hungerford came into the Oliver family and whether there was any connection to the Hungerfords of Windrush must remain a question for another day. That James Hungerford Morgan who became a Jamaican planter came from Bristol is not surprising. With connections to the haberdashery and linen trades and a grandfather who was an ironmonger, it is highly likely that his extended family had been exporting goods to Jamaica for some time. What direct connection they may have had with the slave trade, other than as owners of slaves in Jamaica is unclear, but his son Henry Rhodes Hungerford Morgan died a wealthy man and his estate made compensation claims on two estates. Henry Rhodes Hungerford Morgan had married Elizabeth Lawson from Falmouth who, according to Morgan family tradition, later burnt most of the family papers! Whether she was just obsessively tidy or was trying to conceal something is unclear. 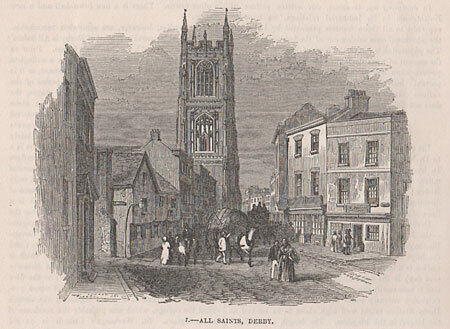 Her husband left a legacy of £200 to a young woman called Julia Hungerford, and, curious to know whether she would explain the link to the Hungerford family, I tracked her down in the parish register of All Saints Derby, where in 1842 she married Richard Lindley giving her father’s name as Henry Rhodes. The later census records show her as having been born in Jamaica, so it seems likely that she was the illegitimate, probably mixed race, daughter of Henry Rhodes Hungerford Morgan, baptised in Manchester Jamaica in 1819, about three years before his marriage to Elizabeth Lawson. So if you have a brick wall in your current research do not give up, the solution is often out there and with more records becoming available online every week it may just be waiting to be found.